It’s still pitch dark when we get off the bus. The journey from Prizren, Kosovo, to Ulcinj in the southernmost part of Montenegro took five hours. Angeliki and I didn’t even realize that we’d crossed the border with Albania. We can’t wait to rest so we take a taxi to Stari Grad, the old town, where our bed and breakfast is. 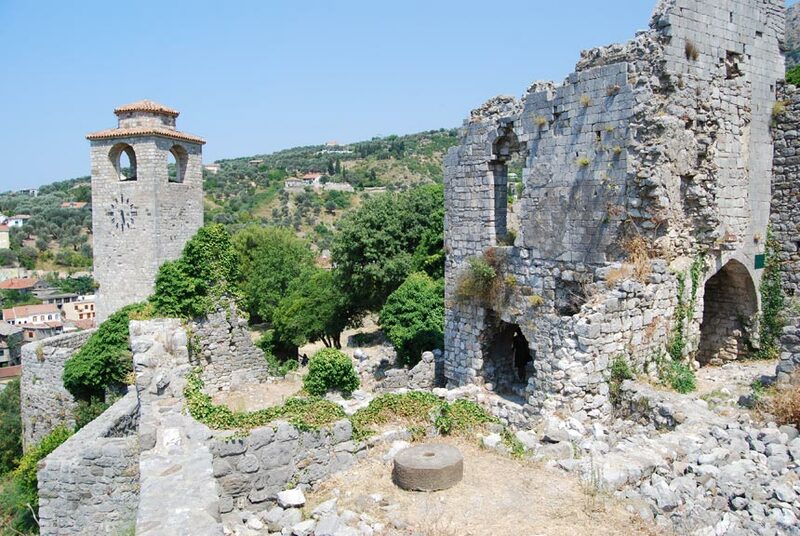 The old town—also called Kalaja, “castle”—is a stronghold perched on the top of a promontory overlooking the city. Here are a small museum, hotels and restaurants, most of which have been rebuilt after the 1979 earthquake. 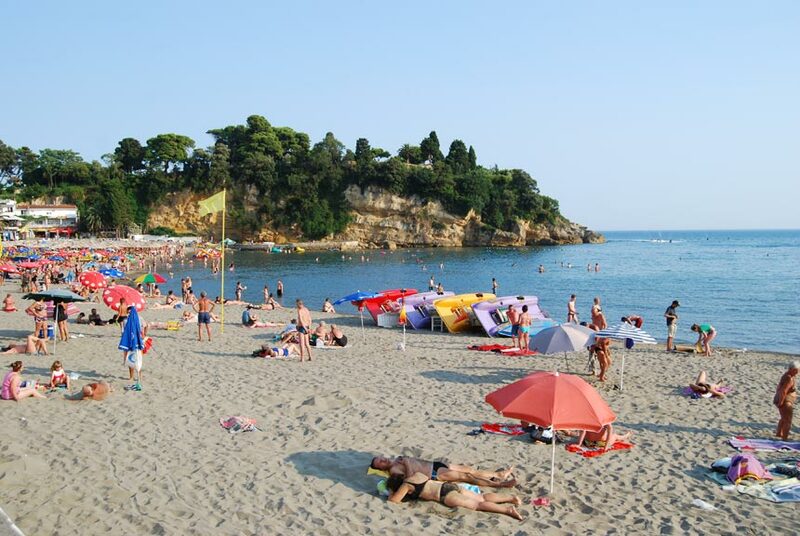 Ulcinj is a very popular destination among Kosovar and Albanian tourists and although the town preserves some traces of its Ottoman past, such as the clock tower and some mosques, what really draws most here are the beaches. Right in the centre is Mala plaža, a small beach packed with beachgoers. 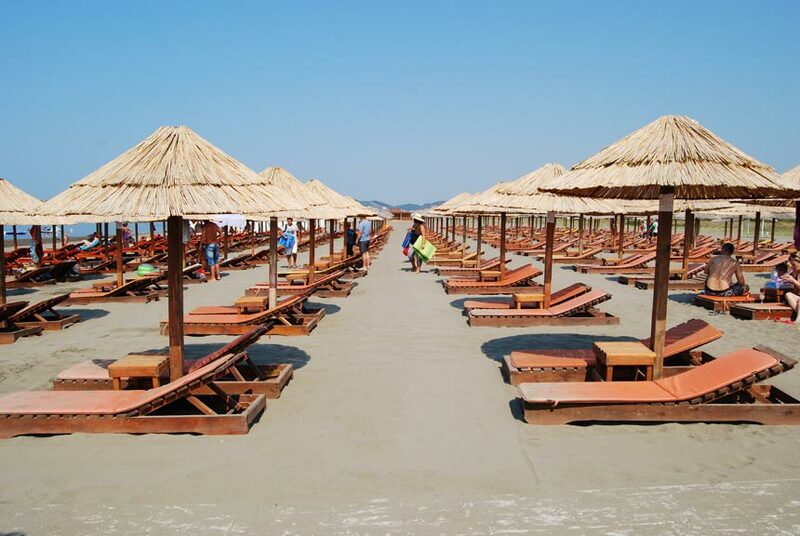 A much better option is Velika plaža, a 12 km umbrella crossed sand strand. 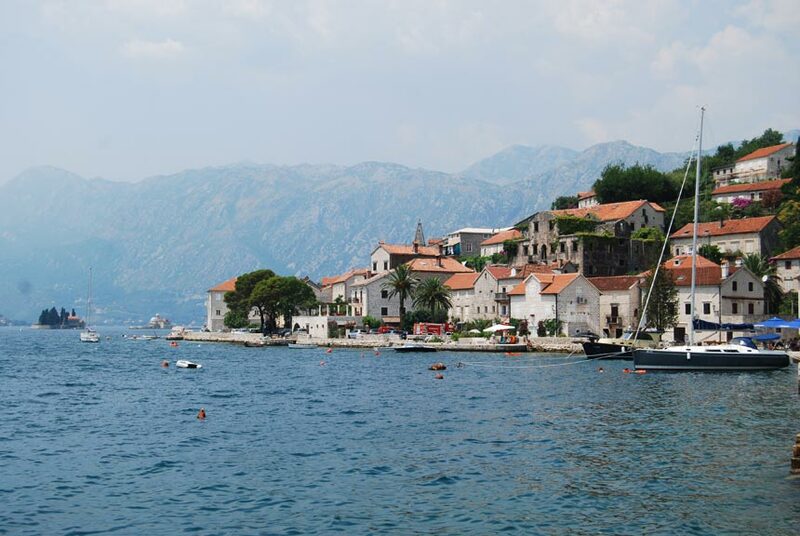 We rent a car and start our road trip along the Montenegrin coast. 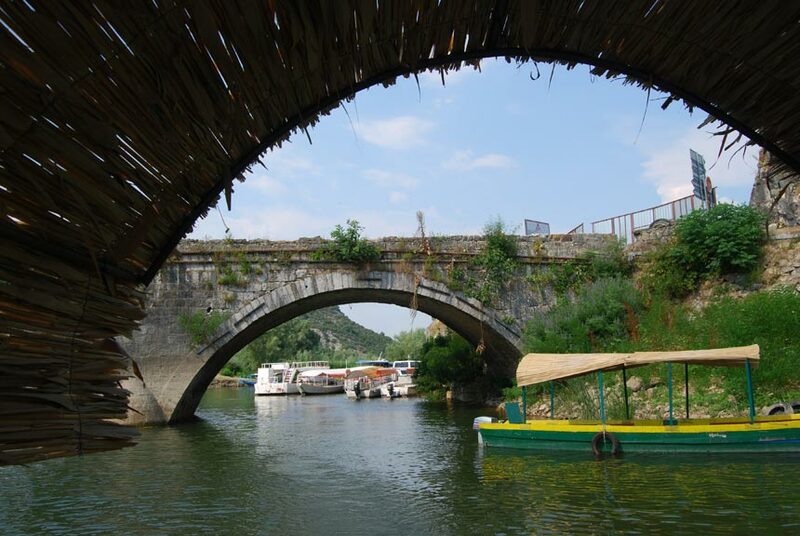 Our first stop is Stari Bar, a medieval town located a couple of kilometers inland from the modern city of Bar. The citadel, encircled by battered walls, lies atop a hill at the foot of Mt. Rumija. We roam around this 1000 year-old center of power, with the fierce heat increasing the impression of desolation. Ruins of palaces, churches and a tall clock-tower are scattered among shrubs and trees. 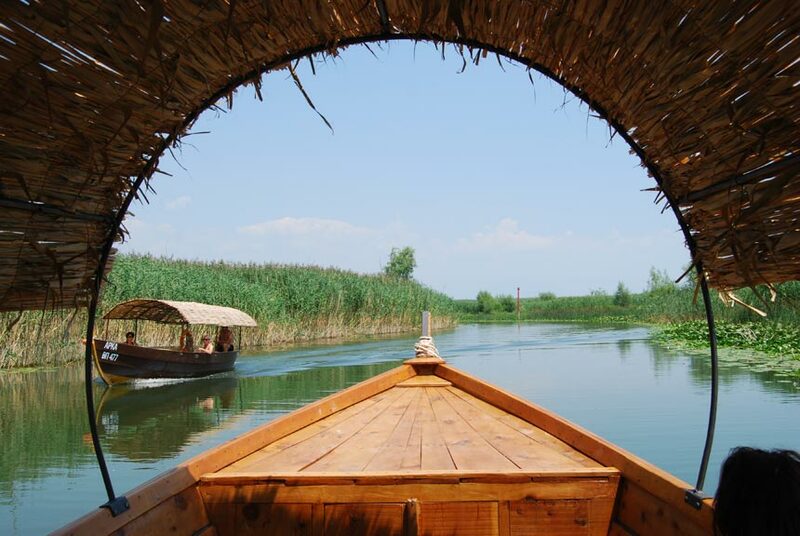 On the outskirts there is a long stone aqueduct and a 2000 year-old olive tree, where we stop for a rest before proceeding north to Lake Skadar. About 45 minutes later we arrive in Virpazar, a tiny village on the shore of Lake Skadar, astride Montenegro and Albania. 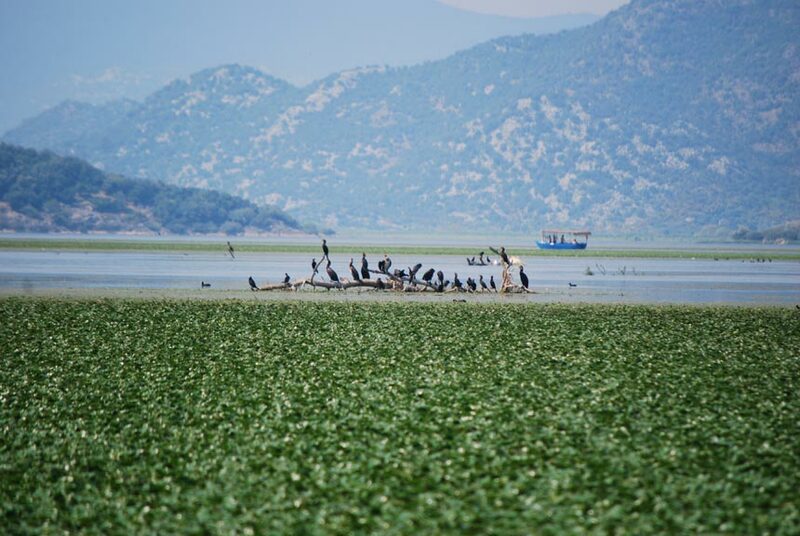 Virpazar is the getaway to any visit of the lake, something you can do on a boat cruise, as we do, kayaking or hiking. Our captain, a young fellow in his twenties, steers our little wooden boat on the peacefully calm waters in an atmosphere of deep tranquility. On the cruise we see a tiny islet formerly used as a prison, a few secluded monastery and churches, thousands of birds amid the swamp vegetation and tree-covered mountain ranges. A winding road leads us back to the coast to Sveti Stefan, one of the most renowned holiday resorts along the Montenegrin riviera. We soon understand why this place is so popular. It rests in an incredibly unique location on a little peninsula jutting out in the sea, connected to the mainland by a narrow artificial isthmus. The rocky islet is entirely occupied by grey stone buildings with red pitched roofs and lush greenery. 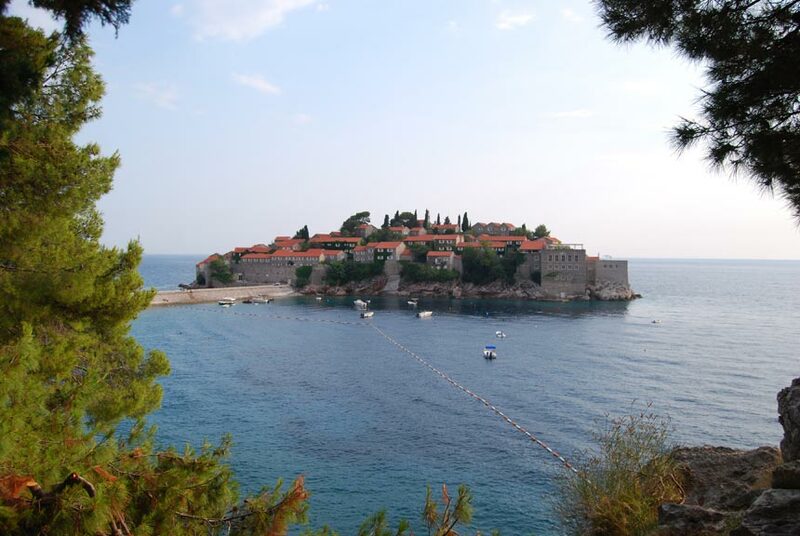 Sveti Stefan was only a fishing village when, in the 1960’s, the Yugoslavian regime converted it into a luxury resort. As we try to make our way to the village, a man at the beginning of the isthmus stops us and informs us that the entrance is reserved only to hotel guests. Practically, this little corner of heaven is off-limits to mortals like us, so we have to content ourselves with contemplating the beautiful scenery from the shore. On the way to Budva, just before we enter the city, we catch the sight of the long seaside blanketed by an indiscernible mass of people and umbrellas. Towering hotels and apartment buildings sprawl across the urban landscape, evidence of Budva’s rapid growth in recent years. In the evening we walk along the bar and nightclub lined waterfront where music blasts our ears and dancers in skimpy clothes beckon to passers-by. Although all this might seem a bit kitsch to us, we have to acknowledge that it’s difficult to feel bored in Budva. For nightlife lovers this is the place to be. A totally different atmosphere welcomes us in Stari Grad, a splendid citadel set on a little peninsula encircled by high walls. Luckily, this part of the city has been spared from unchecked urban sprawl and we can truly enjoy a pleasant stroll around the pebbled alleys admiring historical buildings, churches and the castle. 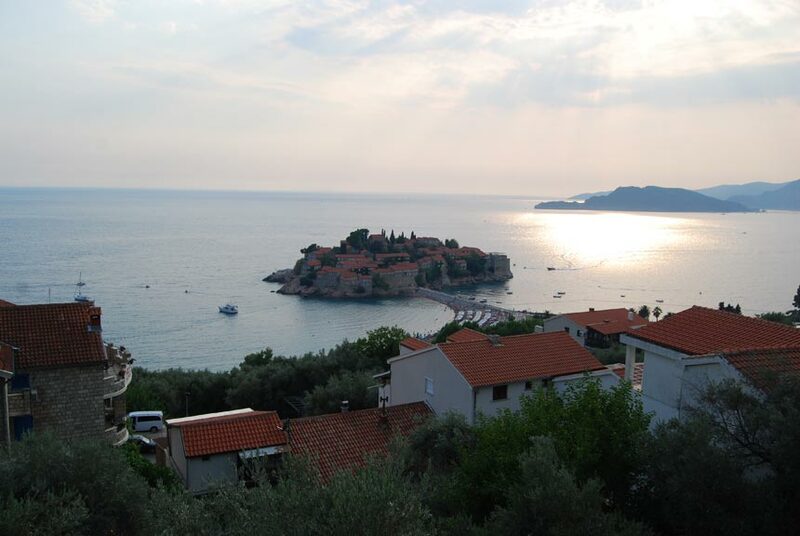 Many travellers also choose Budva because it serves as an excellent location to easily reach several popular places such as Sveti Stefan, Kotor and Lovćen National Park. The latter is our destination the following day. 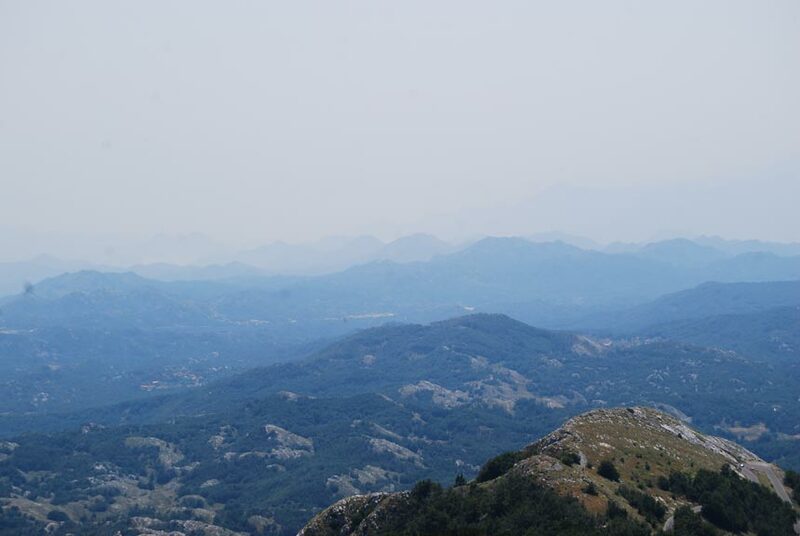 We lose count of the tight, steep turns that take us from sea level to the over 1500 m of the Lovćen massif. 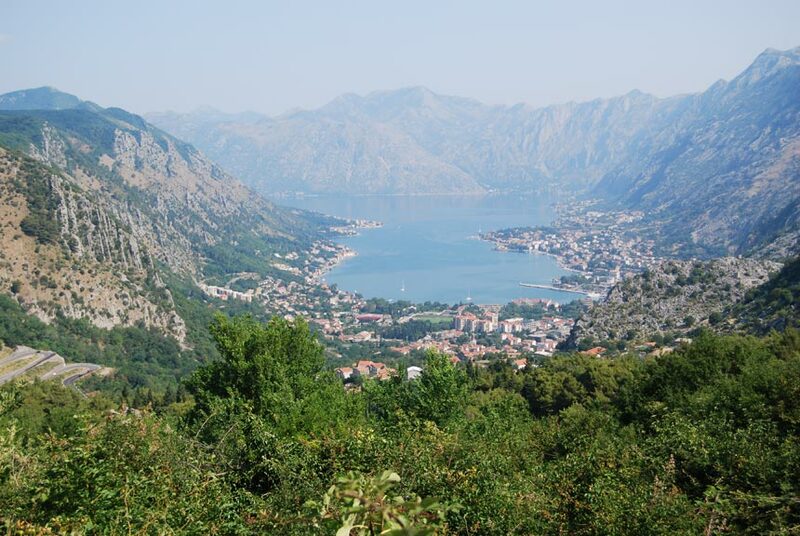 On the way we stop several times to admire the superb views of Kotor Bay from above, surely some of the most stunning I’ve ever cast my eyes upon. Mount Lovcen holds a special place in the hearts of Montenegrins; it suffices to say that the country owes its name to the black mountain. 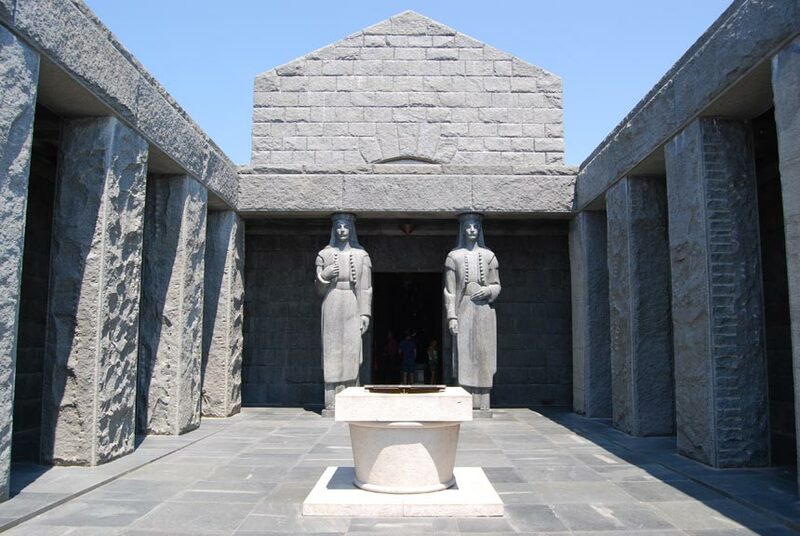 The national park is filled with pristine forests and sprawling glens, its main attraction, however, is the mausoleum of Petar II Petrović-Njegoš, prince-bishop, poet and philosopher. 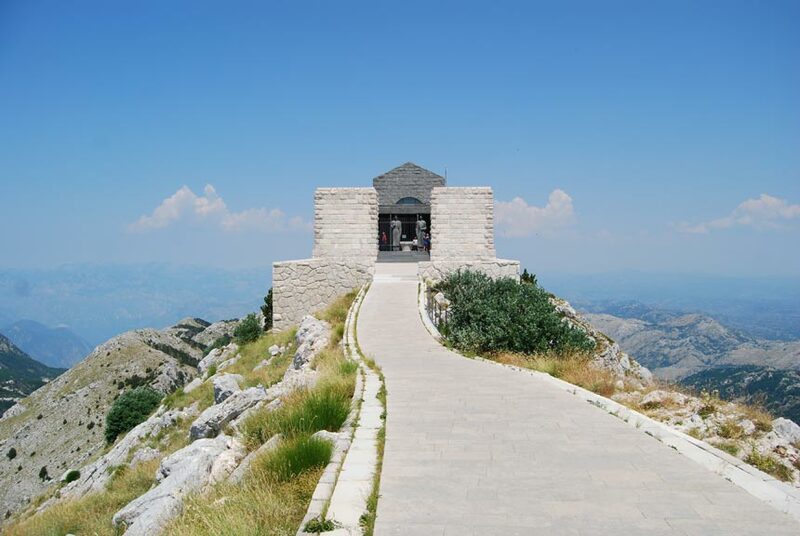 The structure rises ambitiously atop the second peak of the massif at 1657 m. The colossal statues of the mausoleum are impressive, but even more impressive is the view from the lookout, where we can marvel at the dramatic sea of stone of Montenegro, an expanse of mountains which spread to the horizon. 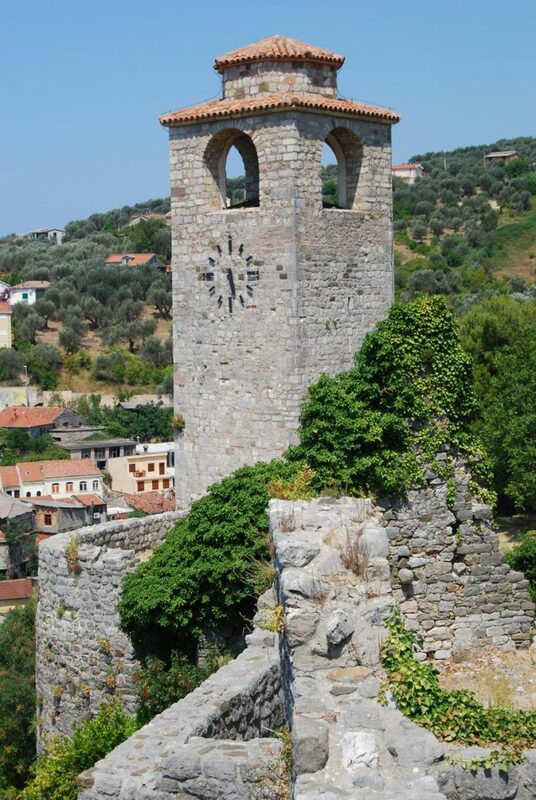 A visit to Lovćen can easily be combined with one to Cetinje, Montenegro’s former capital. This quiet town, where time seems to have stopped in the beginning of the 19th century, is still considered the cultural and spiritual center of the country and boasts an incredible number of impressive buildings, palaces, museums, churches and an old monastery. 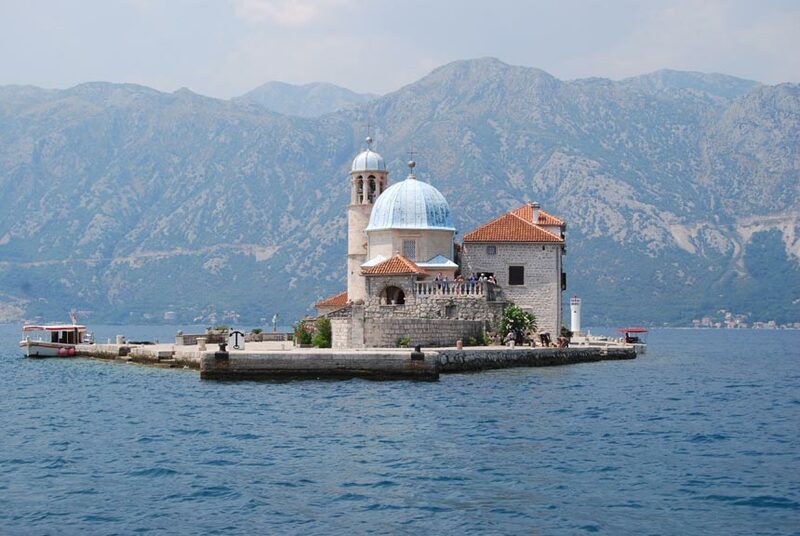 We have left the best for last: the Bay of Kotor is simply one of the most beautiful places in the Mediterranean. I’ve already mentioned the unparalleled beauty of its sight from above. 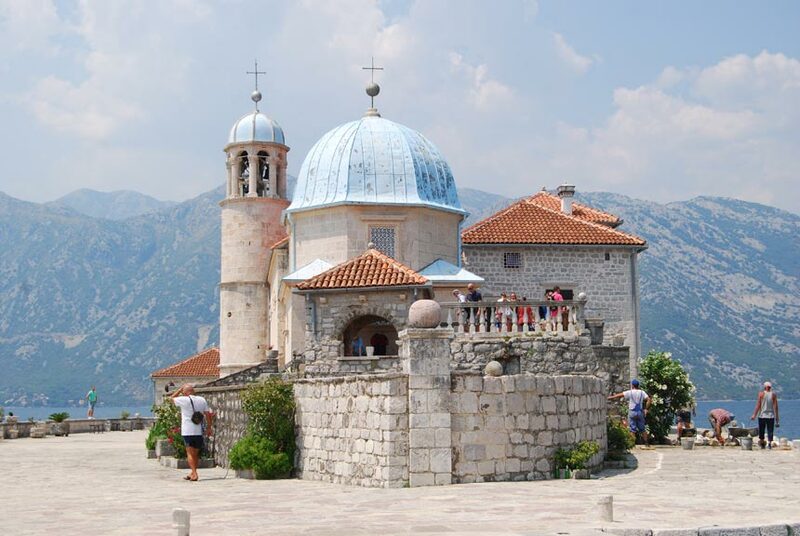 Apart from that, on the shores of the Boka (from the Italian word meaning mouth) lie some amazingly charming towns such as Risan, Perast, Herceg Novi and of course Kotor, the most renowned of all. The old Mediterranean port of Kotor, a UNESCO World Heritage Site, sits nestled between the waters of the bay and steep cliffs and is one of the best-preserved medieval towns of the Adriatic. During the day throngs of tourists pour towards the citadel, filling up shops, restaurants and museums. Because of this, we wait for the afternoon to explore the maze of marbled alleys and gracious squares. The remarkable churches, fine buildings and massive walls testify the glorious past of the city, which experienced a period of great cultural flourishing under Venetian rule. Everywhere we look, in fact, we don’t fail to notice the heavy influence of Venetian art and architecture. When the heat of the day begins to subside, we start the hard climb to the upper fortifications along a steep, winding path. When we reach the top we are totally worn-out, but the breath-taking view rewards the effort. 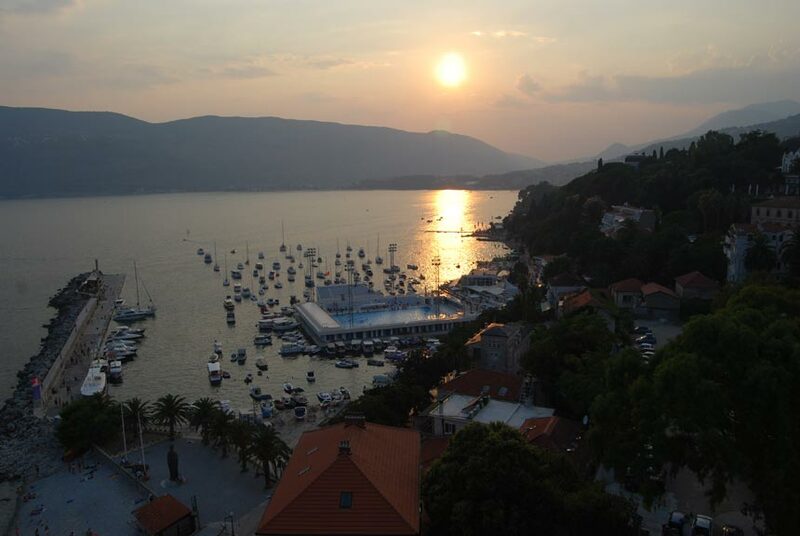 Below us the lights of the town glow and tremble in the placid waters of the bay as the sun sets beyond the mountains in this magnificent stretch of the Adriatic.